Kate Hurster (left) and Denis Arndt (right). Photo courtesy Oregon Shakespeare Festival. The Tempest is one of Shakespeare’s most famous comedies, and for good reason: The heavy use of magic, engrossing romance, and hilarious antics of the several intercrossing plotlines make it an appealing play even for those not very familiar with Shakespeare’s work. OSF’s most recent adaptation looks at the play in terms of Prospero’s “ritual of goodbyes," using ritual Japanese dance among other media to bring to light the play’s philosophical questions about forgiveness and endings. Combining “traditional” Shakespearean settings with more outlandish choices is common to the modern OSF, which combined a 20th century boarding school theme with traditional Elizabethan dress for last year’s production of Midsummer Night’s Dream. Prospero, Ariel, and Caliban are clothed in Japanese minimalism: For example, Prospero’s magic is indicated by four budo dancers (invisible to the other characters). Budo is a dance form indicated by stillness and economy of movement, and the dancers’ hypnotic motions help bring a sense of magic to the stage, as well as refining the nature of the piece. Prospero himself, played by Denis Arndt, shows remarkable development from intimidating king of the island to repentant brother who seeks a modest conclusion to his life. Despite the unusual influences on the island dwellers, many of the other characters are approached more traditionally. Festival veteran Richard Elmore teams up with Barzin Akhavan as a raucous Stephano-Trinculo duo – Elmore’s natural gift at making people laugh compliments Akhavan’s more physical approach to comedy, defying the usual joker-foil relationship. The stranded nobles attempt a Shakespearean history while clearly out of their element: Possibly an in-joke referring to the Elizabethan Stage production of Richard III, also running this year. The set is mostly flat and featureless, allowing the actors to express the scenario through their movements. However, the play frequently toys with light and color, and the sea of red carpet can suddenly change into a confined dark space or a magical evening. The design was not lacking–more to the point, it was devoid of the excess that often occurs in high-budget theaters. 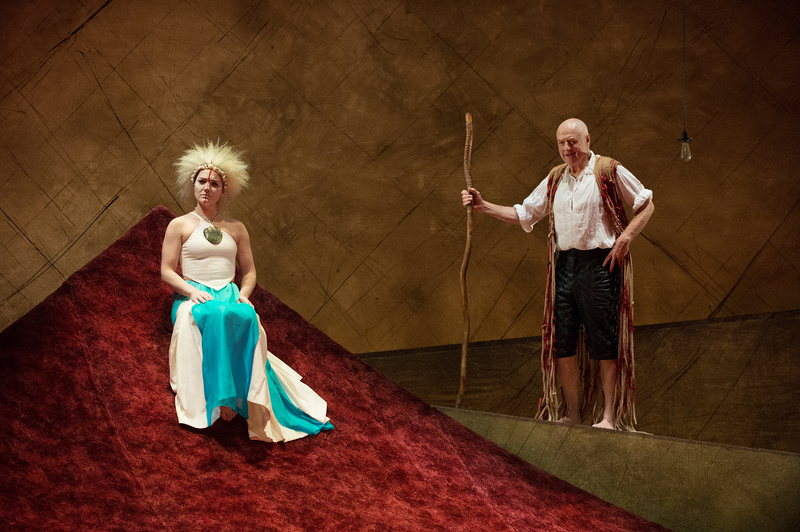 OSF’s new Tempest takes a clear look at Shakespeare’s last play through the introduction of Japanese performance philosophies. The unfamiliar elements force the audience to develop a greater understanding of Prospero’s mission, and in so doing shake the complacency of just sitting through the play. Shakespeare veterans and newcomers alike will find something to appreciate in this play.